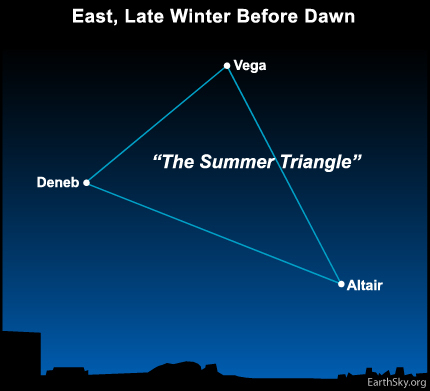 As seen from our northern temperate latitudes, the three brilliant stars of the Summer Triangle – Vega, Deneb and Altair – are out for at least part of the night every night of the year. Presently, the Summer Triangle shines in the eastern sky at and before dawn. Like the Big Dipper, the Summer Triangle is an asterism – a pattern of stars that is not one of the officially recognized 88 constellations. 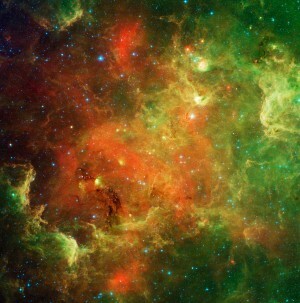 To gauge the size of this signpost star formation, hold a ruler an arm length from your eye. The ruler pretty much fills the gap between Vega and Altair, the Summer Triangle’s first and second brightest stars, respectively. Like all the stars, the stars of the Summer Triangle rise 4 minutes earlier every day, or 2 hours earlier every month. Why is this happening? It is happening because Earth is orbiting the sun, and our night sky is pointing out on an ever-changing panorama of stars. By May Day – May 1 – the Summer Triangle will climb over your eastern horizon around local midnight (1 a.m. Daylight Saving Time). When mid to late June comes rolling along, you’ll see the Summer Triangle sparkling in the east in evening dusk – a sure sign of summer’s return to the northern hemisphere.